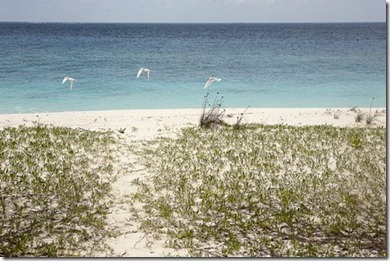 During the safari, guests can find special banks and remote reefs to visit or snorkel. The excursion includes a guide to both make sure everything goes smoothly, help in case of any difficulties and show you the best spots to visit. Our family regularly jet skis when we visit my wife’s sister who lives by the ocean in North Carolina. They are loads of fun. A number of Maldives aficionados protest the sound they (and other motorised water sports) make disturbing the ildyllic tranquillity that draw so many to the destination in the first place. 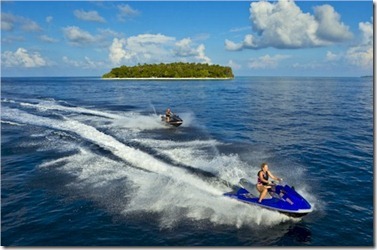 The safari is also a plus to them because it takes the guests on their buzzing boats (though Kurumba has brought the latest models that have the lowest noise) far away from the resort island itself to places where no people are. A 90 minute excursion for 2 people costs $300. Rev your engines for adventure. This week (25 April 1719) marks the publication of the classic by Daniel Defoe, ‘Robinson Crusoe’, whose story epitomises idyllic, simple living on remote island paradise. Though set in the South Pacific, the story’s imagery pervades the Maldives with many resorts offering ‘Robinson Crusoe’ experiences and adopting the namesake. 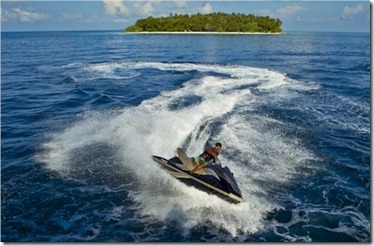 Such as the ‘Robinson Villa’ at Soneva Fushi and even the ‘Robinson Club’ resort itself. 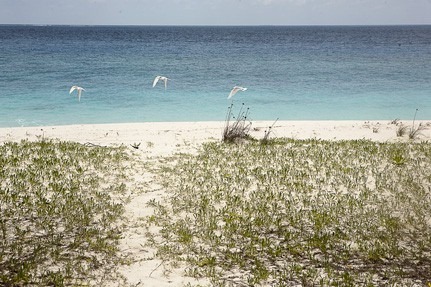 And if the resorts themselves don’t offer enough isolated wonders of seclusion for you, most offer a ‘Robinson Crusoe’ excursion which take you to a deserted island all to yourself several hours or even a whole day. 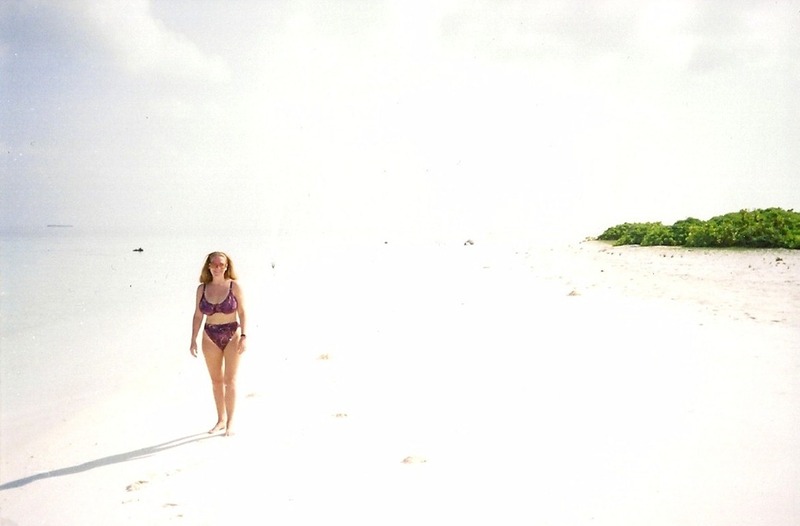 One of Lori’s and my favourite experiences was one of these outings when we stayed at Filitheyo and took the trip to Hamza island for the day (see pix below). I’ve already highlighted Medhufinolhu as a top Overnight Escape (Coco Palm is one of a few resorts to offer an overnight option), but it is just as spectacular for day visits too worthy of a second shout out. 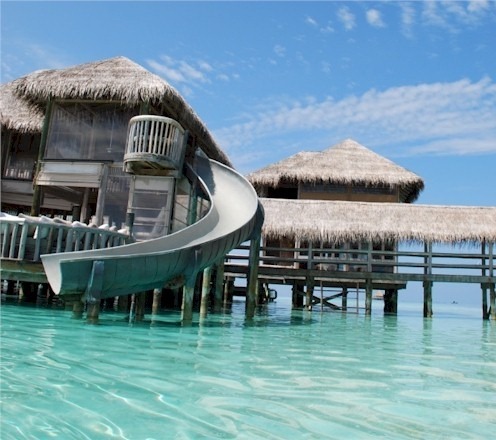 Despite the Maldives renown as a honeymoon destination, I’ve yet to see some of the trappings of American nuptial meccas like Vegas and Pocconos. Where are the rotating heart shaped beds under a mirrored ceiling? Well, maybe the Maldives have kept it all a bit classier than that, but if you are into mirrors, the resort to check yourself out in is the W Retreat. 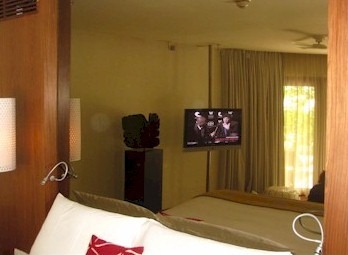 The extensive use of mirrored glass is all part of the glossy design chic that prevails at the W.
While you won’t find a mirrored ceiling, you will find a gigantic mirror behind bed floor to ceiling. 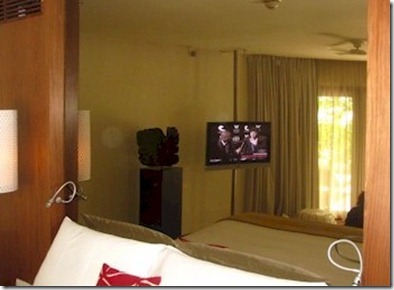 There’s another mirror on the side wall and the closets decorated with mirrors. Behind the bed of the Ocean Haven villa master bed even has a sort of mirror sculpture. Tis indeed the season for taking the plunge. The nuptial plunge. Bridal magazines are cascading off the newsagent shelves, harried betrothed are scrambling for church bookings, and couples are getting vase.into their charming first rows over patterns for the bridal registry. Why not avoid the latter most with gifts that everyone can agree on? 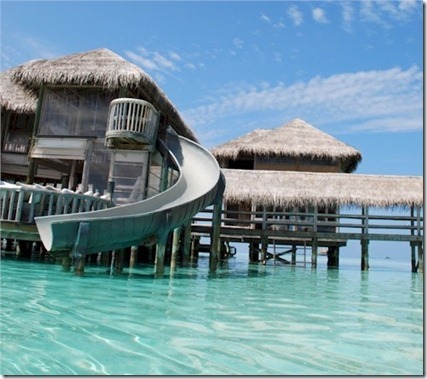 That is, just about anything enjoyed in the Maldives. 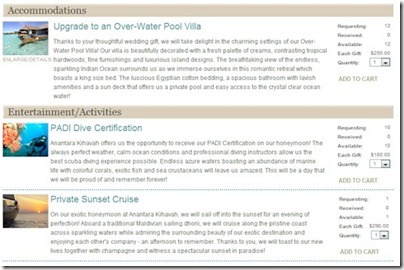 Anantara (all of their Maldives properties – Kihavah, Veli, Dhigu) has introduced a ‘Honeymoon Registry’ with gifts like an ‘Upgrade to an Over-Water Pool Villa’ or a ‘Private Sand Bank Day Trip’. When Lori and I tied the knot, we loved getting cash as gifts as we were so impoverished. Starting our lives and blowing so much on the event. During our honeymoon, we tracked our special treats (eg. nice meals out, horse and buggy ride, trip to the amusement park) and what we spent on them. Then, when we got back and dug into thank-you note writing, and we attributed the cash gifts to the treats we enjoyed. The generous gift givers seemed to really enjoy the fact that they contributed to something special rather than just topping up a bank account. The registries are such a help to guests and loved ones who want to make a gift. You never know quite what to get especially in these days where many people do already have a lot of the basic household items. Not to mention that massage or beach dinner sounds much better to give than a toaster or vase. At Soneva Gili, its ‘Private Reserve’ water villa, you can *be* the waterfall. That’s a second item ticked off my ‘Not Seen Yet’ list. Landaa’s Manta isn’t the only artistic artificial aquatic feature found on land. 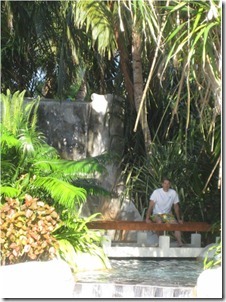 Sheraton Full Moon’s waterfall is the biggest in the Maldives. A towering drop with a little foot bridge over the subsequent stream that then trickles down a few other levels further. There is a shaded bench you can sit on as a lovely spot to sit and take in the ambience of a different sort for water lovers to enjoy. Both the waterfall and the manta are examples of the latest new category that I have added to the ‘Best of Maldives’ (Infrastructure) page – ‘Art’ (including various forms of Décor). 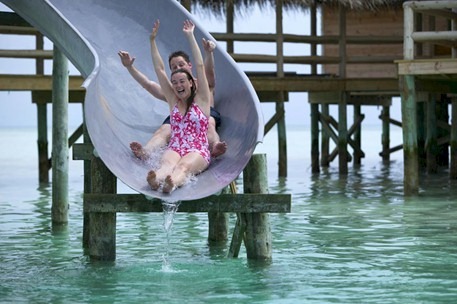 One resort can *guarantee* that you will be able to enjoy the spectacle of the soaring Manta. Four Seasons Landaa Giraavaru is a major destination for Manta watching with their proximity to the manta favoured Hanifaru, their ‘Manta Ray Research Project’ and their special ‘Manta on call’ service. 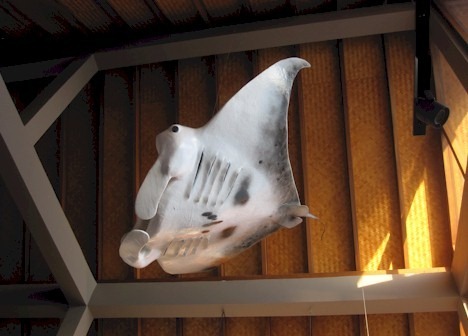 But even if all that falls through, you can always enjoy their manta masterpiece they commissioned for their Marine Discovery Centre. The piece was created by British artist Scott Gleed who specialises in marine subjects like sharks and mantas. Finalist in the David Shepherd International Wildlife Artist of the year competition, you can find his work at the Paris Aquarium, Imperial War Museum and the House of Fraser. He also does commissions and private sale pieces if you wanted a memento of your own manta encounter. Sometimes a ‘Best Of’ involves no particularly unique ingredient, just assembling the pieces in a distinctive way. 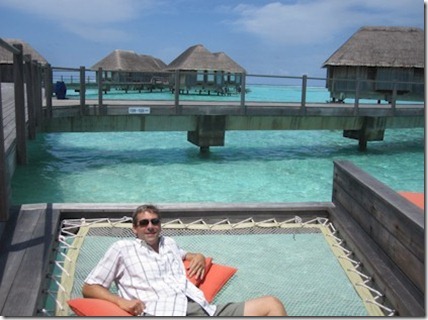 That is how I felt about another lounge on the water, Club Med Kani’s ‘Manta Lounge’. 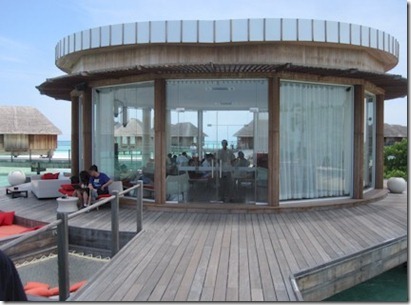 It is part of their ‘5 Trident’ luxury water villas area. 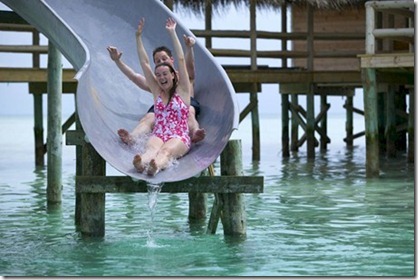 On face value, there is not much there that you wouldn’t see in one form or another especially at the higher end resorts. But something about the execution impressed me so much that I imagined if I was staying at Kani (I was only there one day), then I would probably spend a fair amount of time at Manta. Shielding from the rays when you’ve had lots of sun. Air conditioning when you had lots of heat. Wide variety of seating when you’ve had lots of beach loungers. Wifi when you’ve had lots of time away from web surfing. Easy access to refreshments on offer when you have lots pangs of hunger and thirst. Many resorts have enclosed lounges and libraries, but most of the time they are sequestered by reception with little view and buried in the main complex. Lots of resorts have sitting areas out on jetties, but most of the time, they are uncomfortable wooden bench with a modest palm canopy. 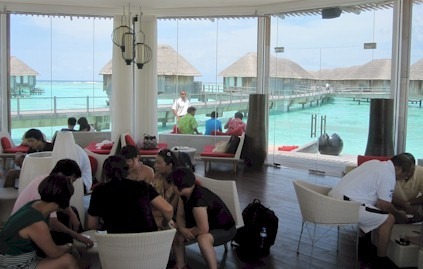 The Manta Lounge was the best of the jetty rest areas combined with the best of the reception lounges. 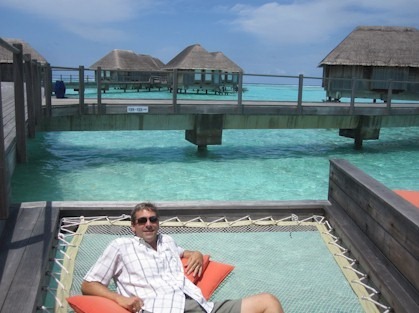 As a bonus, they had the overwater hammocks which are lots of fun and comfy, but mostly I have seen them as features on private water villas and not available to the general guest population. For a bigger sailing sunrise and cruise that is just as enjoyable in silence, Shangri-La Vilingili has one of the best bows I have seen for relaxing in the best seat in the house. Sofa on the foredeck. Brill. Lori and I have done our fair share of boating from your brother-in-law’s 50 foot catamaran on the North Carolina Intercoastal waterway to sailing with various friends. 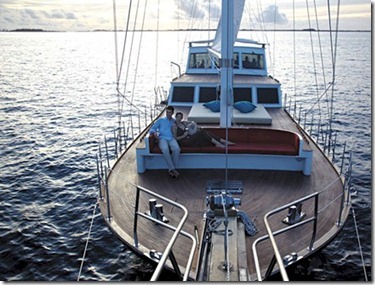 One of the favourite places to settle down for the ride is the very bow of the boat. A la Titanic ‘king of the world’ style. The problem is that it never seems to be that comfortable up there. Anchor chains and other rigging get in the way of truly stretching out. 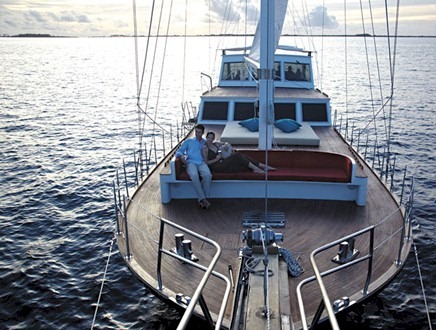 While not at the tippy-tip of the prow, I nonetheless love the Villingili luxury yacht Horizon’s sofa situated on the foredeck for languid place to stretch out and truly enjoy the ride. Sitting on the sofa at home watching Graham Norton somehow doesn’t compare with sitting here and watching the sunrise.